On April 3, 2014 I had the opportunity to be on Sam Rangel’s Amazing Teacher Podcast. It was a great experience. Below is the blog post Sam wrote about our time together. I am also including the podcast itself. I encourage you to listen to it. I also encourage you to listen to the other shows on his website. He has talked to some very talented teachers, and his collection of podcasts is a great resource for new and veteran teachers. For the Podcast with me and Sam click here. 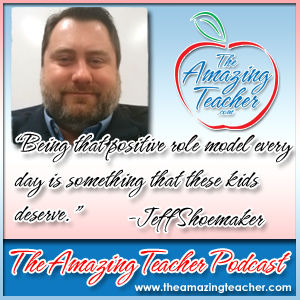 This week, my guest is Jeff Shoemaker, known online as the Gifted Teacher. What characteristics are common in gifted students? How do you best engage gifted students? These are all questions that Jeff answers on the podcast. Jeff also shares his insights in what makes teachers amazing. He shares on the podcast that amazing teachers are passionate. The love what they do. Jeff states that amazing teachers have the ability to inspire students to go beyond what they believe they can do. I had a great time picking speaking with Jeff. He is a great resource for teachers who are looking for ways to better meet the needs of not only gifted students, but all students. Make sure you check out his blog for more amazing tips. As always, thank you again for spreading the word about the podcast.